The film crew from Grand Canyon University had barely arrived at Fire Station 9 when sirens went off and firefighters began spilling out. “Are you the film crew from GCU? We can take two of you,” one firefighter said hurriedly as the five GCU students were walking up to the front door. As the adrenaline rush kicked in, Mike Myers and Bryce Bowen grabbed their video equipment and jumped aboard the fire truck, sirens blaring, en route to an emergency call for a person having a seizure. And with that, the students’ glimpse into the life of a firefighter began — an experience they chronicled with a 13-minute documentary video that will be shared with cancer patients at Phoenix Children’s Hospital on Thursday afternoon. That first emergency call came during a meet-and-greet session with members of the Phoenix Fire Department, and provided a glimpse of what was to come when the students returned to spend an entire 24-hour shift at Fire Station 9. Engineer Ryan Place explains some of the machinery on a fire truck to GCU film students Bryce Bowen (with camera) and Janna Strutowski. Their shift began at 7 a.m. and included a full day of training exercises with the firefighters, emergency calls at all hours of the day, meals and a trip to the grocery store. But what the students did see was eye-opening. An apparent drug overdose in which two females, among a group of five males, had been left on the front porch of a house at 4 a.m.
A water break when a vehicle crashed into a fire hydrant. Paramedic calls for people having heart and lung issues and internal bleeding. GCU film students pose alongside members of Shift B at Phoenix Fire Station 9. Top row (from left): Students Mike Myers and Bryce Bowen. Bottom row: Firefighter Shaun Dubois, engineer Ryan Place, engineer Eric Holt, firefighter Josh Lorenzen, students Nick Fanelli and Janna Strutowski, firefighter Jerry Devalle, captain Scott McDonald and captain Eric VanDerToorn. The late-night calls were especially challenging for the college students. The film project was the brainchild of senior-to-be Nick Fanelli, who came up with the idea five years ago while working at Doernbecher Children’s Hospital in Portland, Ore.
Wednesday is bingo day at Doernbecher, but only about half the kids can make it down to the room where the bingo game is played. The rest participate via closed-circuit TV in their rooms. When Fanelli later enrolled at GCU and began working at Phoenix Children’s Hospital, he saw the video class as a way to turn that vision into reality. Assistant Professor Gregg Elder, who teaches a class in music video/documentary production, said it was an ambitious project, particularly toward the end of a school year. Firefighters gather around a computer at Fire Station 9 for a screening of the documentary “A Day in the Life of a Firefighter” that GCU students filmed. The students began with 10 hours of raw footage and took turns spending more than 100 hours on the editing computer to whittle it down to the final 13-minute video. The other challenge was making sure the documentary was kid-friendly and informative. “We tried to simplify things as much as possible to appeal to kids … and use visuals to help them retain the information,” said Chiara Spence, a senior-to-be from Mesa. 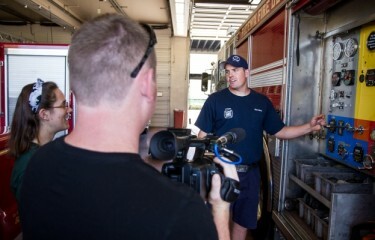 Scott McDonald, a public information officer for the Phoenix Fire Department, said the Station 9 firefighters fell in love with the video idea immediately. That sense of belonging and camaraderie wasn’t lost on the GCU students. It extends beyond the firehouse walls as well. “We went grocery shopping with them and everybody knew them by name,” Bowen said. “It was like being in a small town. Contact Bob Romantic at 639.7611 or bob.romantic@gcu.edu. I got God Bumps when I read your story. How awesome! People never think about the hours and the work that goes into something so unselfish as this. 10 hours into 13 minutes and how you guys had to be awakened from sleep and active and in the truck within a moment was awesome! I know without meeting you that your way of feeling has evolved because of the experience and wish I could have been there to see it first hand. Thank you for the story and all the hard work and excitement that went into it.